Nothing is bound to make anyone remotely interested in style and quality tremble with excitement than the name Hermès. 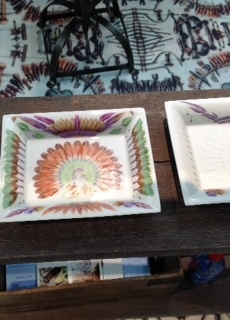 So imagine our state when we were invited to a special breakfast for Hermès Festival des Métiers press preview. Feeling extremely privileged, we went to what was a fascinating few hours watching craftspeople demonstrate their skill at making what is the name of luxury goods. The name Hermès is synonymous with all that is exclusive. Seeing this exclusive exhibition at the Saatchi Gallery in Sloane Square you will understand why a Birkin bag still has the waiting list, years from the original release date, why the Hermès scarf is a must-have even if the only way to care for it properly is a trip to the dry cleaners, and why a Cape Cod watch says: “I’ve arrived with a whisper,” but still gets the message across. It is easy for lots of modern brands to command a high price point often without good cause. 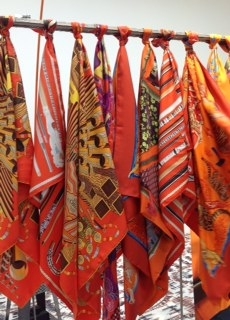 At this very short exhibition, you get to see ten different Hermès crafts showcased at London’s Saatchi Gallery, from 21st May until 27th May 2013. Observing a watchmaker pull together a watch with precision makes you understand why the three years of training in Switzerland to learn watchmaking seem so necessary. 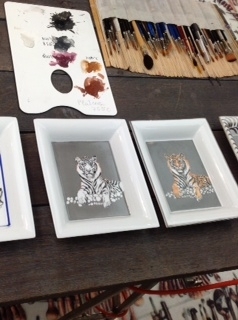 It is also worth the wait to see up close the steady hand of the illustrator as they hand-paint each individual tiger on a ceramic plate. This is a real must, so get to the Saatchi Gallery while you can. The week-long exhibition is bound to be popular. Watching the craftspeople as they make the unique crafts that are the essence of the house of Hermès up close is not one you can afford to miss if you want to understand the DNA of this historic brand. For more information, visit the Saatchi Gallery here.